cities are slowly gnawing at the most fertile and productive lands. This was revealed in a study conducted by National Aeronautics and Space Administration (nasa) scientists. Though construction activity has been carried out on only three per cent of land in the us, the resulting loss in plant growth was enough to offset gains made by agriculture. The study was conducted by Marc Imhoff and his colleagues from nasa's Goddard Space Flight Centre in Maryland. It calculates that urbanisation is reducing dry vegetation in the us by 91 million tonnes each year. And if all of it were edible, it would be enough to feed around 450 million people. "This gives an idea of the biological significance (of urbanisation) for the food web in general," points out Imhoff. But it's definitely more alarming for the developing countries. While the us has the land to feed its people, the same is not true of countries such as India and China. If this pattern is repeated in these countries, the loss of agricultural land could have a serious impact on food supplies. The negative impact of urbanisation has also been felt in other ways. Forests and croplands, which act as carbon sinks by absorbing carbon dioxide, are also prey to this activity. To gather their data, Imhoff and his research team used a weather satellite. On clear moonless nights, the satellite picks out city lights, oil flares, forest fires and even lightning strikes. The team used this information to map all the mainland us states except Alaska. They were divided into three categories of land use: urban, urban periphery and non-urban. The team then calculated how active the vegetation was in each region, using satellite data that maps red and near-infrared frequencies reflected by the chlorophyll of photosynthetic plants. Combining this information with weather conditions such as temperature, humidity and rainfall gave them the amount of plant growth in each region. The researchers found that in the mid-1990s, urban areas cost the us 40 million tonnes of carbon each year. 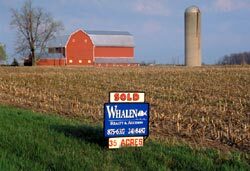 Some 29 per cent of the total land area of the us is devoted to agriculture. Compared to this, urbanised areas that account for the decline occupy just three per cent of the total land area. "This means that the very best soils are indeed the ones that we are urbanising," contends Imhoff. Cristina Milesi from the University of Montana in Missoula agrees. Her own December 2002 study used similar techniques to show that urbanisation in south-eastern us had risen from 4.5 per cent of total land area in 1992 to 6.4 per cent in 2000 -- far above the national average of 3 per cent. "We are replacing something that was extremely productive with lawns, golf courses and a few scattered trees," laments Milesi.